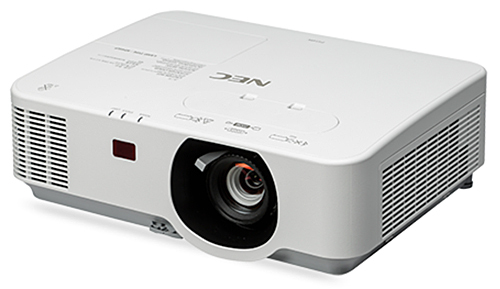 There aren't many low-cost 5000 lumen professional installation projectors that are both capable enough and bright enough for corporate boardrooms, higher-ed classrooms, and similar venues. However, NEC's newest generation of its P-Series--the NEC P474W, P474U, P554W, and P554U--are eye-catching choices that fill the bill. Each one stands out for a particular combination of brightness, resolution, and low price, at $1,599 to $2,199 street. All four P-Series models are built around a three-LCD chip design, which guarantees matching white and color brightness, so full color images will be as bright as you would expect from the white brightness ratings. 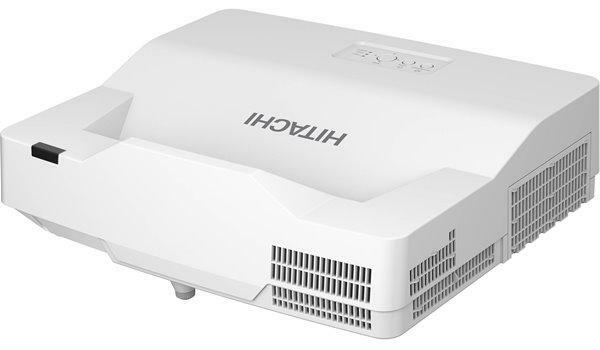 Each of these four projectors also earns points for easy setup and maintenance, which is always welcome in any boardroom, conference room, or classroom. Key conveniences include horizontal and vertical lens shift and an HDBaseT port so you can use a single cable to both send data and control the projector over a network. A long lamp life, at 4,000 hours in Normal mode and 8,000 hours in Eco, also helps keep the total cost of ownership down. Lamp replacements are only $129, and you can replace the lamp without having to remove the unit from a ceiling mount. Other notable features include a 10.6-pound weight for easy handling whether setting up in a ceiling mount or moving from room to room; a 20-watt speaker on board, which should deliver high enough volume for a large room; and support for the NEC MultiPresenter Stick, which allows connection to as many as 12 devices and will be of particular interest for classroom use. All four also support Crestron Roomview. The slightly different zooms for models with different resolutions--at 1.65x zoom for the 1280x800 models and 1.75x for the 1920x1200 models--results in a somewhat different range of throw ratios. For a 150" image, for example, the range is 12.75 to 22.25 feet for the P474W or P554W versus 12.75 to 21 feet for the P474U or P554U. You can use the Projection Calculator to find the range for the image size you want. Choosing the right model from this group is easy. Just pick the one with the brightness you need--4,700 ANSI lumens for a mid to large-size boardroom, conference room, or classroom with typical lighting, or 5,500 lumens for larger rooms or brighter light--and then choose the resolution--1920x1200 if you need fine detail, or 1280x800 if you don't. The NEC P474W, P474U, P554W, and P554U all offer setup flexibility with H+V lens shift along with the long zoom range. They also come with a 3-year warranty plus 1-year or 1000 hours for the lamp and 1-year of your choice of next-day exchange or 3-business day repair and return. With all this and the aggressive pricing to boot, each model promises to be a strong contender for the boardroom, conference room or classroom.